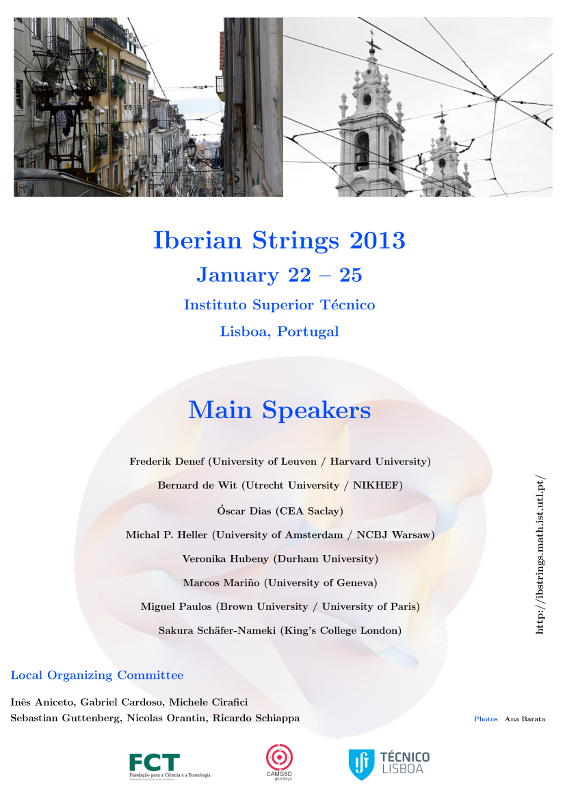 The Iberian Strings 2013 meeting is the fourth meeting of the Iberian Strings series, superseding previous editions of the Workshop on Gravitational Aspects of Strings and Branes and of Northwest Strings. These meetings bring together a large part of the string theory community of Spain and Portugal and aim at discussing recent advances in the field of strings and branes. String theorists working elsewhere are also welcome to participate at the meeting. Iberian Strings 2013 will be held at Instituto Superior Técnico (Lisbon/Portugal) from January 22 till January 25, 2013. The previous meeting took place in Bilbao. Those interested in participating have to register by sending an email to Gabriel Cardoso, see the information mentioned in Contacts. There is no registration fee. PhD students are encouraged to participate at the meeting. Participants (with the exception of the lecturers) are responsible for making their own hotel reservations. The organizing committee made block reservations at various hotels nearby the IST campus, see the list in Local information. This conference is supported by CAMGSD and LARSyS.